Here’s a special find! The Shreveport Times just ran a featured article on the uncovering of a “hidden treasure” at C.E. Byrd High School in Shreveport, Louisiana. A forgotten mural by our very own The Little Mouse Santi author David Eugene Ray! “When David Ray graduated from C.E. 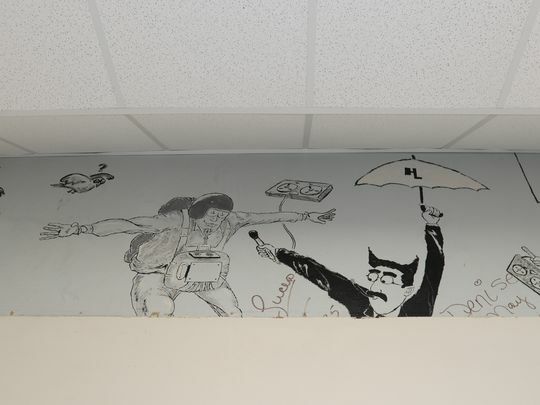 Byrd High School in 1978 he left behind a treasure, a mural full of cartoon characters, hidden from the public eye for more than 35 years.Hamm Mechanical found the mural while replacing the air conditioning system in early June, said President William Hamm. Perhaps it’s time you illustrated your own book, David Ray!